IoT sensors measure voltage levels, count duty cycles, and use other means to gather data that can be used to predict equipment failure.  Your business knows how to repair failed equipment when it fails. How about fixing it at the time of your choosing before it fails? 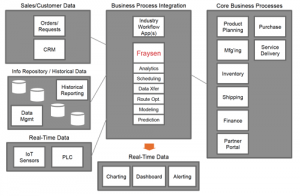 Waiting until equipment fails incurs greater expense and impacts customer service. How can you use the equipment right up to the moment before failure and then repair or replace it—minimizing or outright avoiding—downtime? 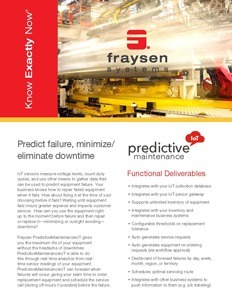 Fraysen PredictiveMaintenanceIoT gives you the maximum life of your equipment without the headache of downtimes. PredictiveMaintenanceIoT is able to do this through real-time analytics from realtime sensor readings of your equipment. PredictiveMaintenanceIoT can forecast when failures will occur, giving your team time to order replacement equipment and schedule the service call (during off-hours if possible) before the failure.